Although lean design increases efficiency and patient care, and lean construction reduces schedule and capital costs, these improvements are secondary compared with the opportunities for improvement in the long-term operating costs of a healthcare facility. The real focus on continuous improvement needs to be on the efficiency of the building and ease of operations and maintenance over time, as the lifecycle costs of a facility far outweigh the initial cost. One of the largest healthcare providers in Washington state, Providence Health Services, serves as a case study of some of the issues involved in this approach. Providence recognized the importance of building operations and long-term maintenance in designing their new 12-story, 713,644- square-foot medical tower to house the system’s emergency department, diagnostics imaging, surgical suites, intensive care unit, and acute inpatient care. To facilitate this long-term operations planning conversation, the Providence facilities team identified internal personnel to take responsibility for the maintenance and operation of each of the new facilities early in the design and preconstruction process. The facilities team attended meetings from design through construction, and participated in discussions on equipment selection as well as quality control inspections during construction. These designated facilities staff managed the systems start-up and building commissioning process to further integrate their understanding of the new buildings. After turnover, one construction team member stayed engaged for 18 months and attended every facilities meeting to assist in transitioning the facilities team to full operation of their new facility. Another issue facing many healthcare providers and facilities teams is the need to capture and share information. When Providence’s facilities team lead retired, leadership saw the need for a streamlined operations and maintenance system that stored information about building systems, maintenance, repair requirements, and more. Providence selected a computerized maintenance management system (CMMS) which allows anyone on the facilities team to access accurate, real-time information about any building system. Providence Regional Medical Center’s Colby Campus in Everett now has 80 percent of its facilities in their CMMS system. The outcome of this all-inclusive team was a high-level approach to long-term building efficiency and future flexibility. For example, to accommodate future needs, waste and vent stacks were installed in every other column on a 30-foot grid. This effort made at long-term planning gives Providence the flexibility to remodel or make layout changes in the future with few disruptions to patient care. Lean is a journey that is focused on continuous improvement, and there are many best practices for the implementation of lean design and construction techniques. The most important part of lean design is the project team. The team should include a design architect, engineers, a contractor, and trade partners that all have experience working in this methodology and a mindset that’s focused on increasing efficiency throughout the entire facility, not just a single project. Stakeholder inclusion at every step is necessary for the most efficient process. The end users’ needs should both inform and drive the design, and include the perspectives of hospital staff and facilities management. It takes collaboration to gather all of the necessary components to inform design. Designers study and evaluate typical work behaviors, but end users provide direct insights into their daily activities, ideas for streamlining their work, and insights into how a building will be used, operated, and maintained. Once design concepts are developed, end users should evaluate common spaces like lobbies, waiting areas, nurse stations, and patient rooms through virtual mock-ups. 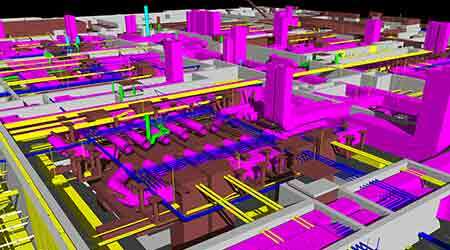 This allows the design and construction teams to confirm that their vision meets the expectations of the end user and allows for changes to be made prior to material procurement and the start of construction. Thoughtful attention and management of this mock-up stage also contributes to reduced project costs because fewer changes will be needed later. Lean methods and techniques streamline design and construction activities, decrease costs, and maximize efficiencies in healthcare facility operations and long-term maintenance, thereby supporting the patient care mission that is central to healthcare organizations. Mark Baughman, a construction executive with Mortenson Construction, has focused the last 10 years of his career on the construction of healthcare facilities.